Patrick McIntosh isn’t a man afraid of a challenge! Not content with trekking to the South Pole or beating cancer three times, Patrick is taking on his next challenge – his Lifecycle. And supporting his local hospice, St Catherine’s Hospice, in the process. Patrick is attempting to cycle around the world to raise awareness of the fight against cancer. In May 2019, Patrick will begin his epic cycle ride, taking on a journey of over 7,000 miles to Japan. Eventually he hopes to go on to circumnavigate the world. Patrick will cross several continents in a staggered two year journey during his global cycling challenge. In May, he will set off from St Catherine’s Hospice in Malthouse Road, cycling towards Pease Pottage, which will be the site of a new, larger hospice building in years to come. 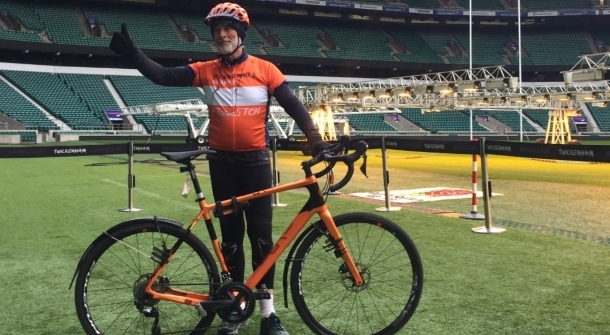 From there it’s off to Twickenham Stadium before cycling across Europe and Russia, with the aim of reaching Tokyo for the opening game of the Rugby World Cup in September. As part of his cycle ride, Patrick is raising money for the new hospice building. He said, “It’s an honour to support St Catherine’s as part of my next big adventure. As a cancer survivor I know the importance of their vital care. And I want more people to be able to have hospice care in the future so I’m raising money for St Catherine’s new larger hospice. After a well earned rest, Patrick intends to continue the next leg of his global cycle ride in early 2020. During this journey Patrick plans to cycle across North America and Iceland, and to visit Ireland, Scotland and Wales on his route back home.